Power bars, energy bars, call them what you will: they’ve long been a fixture in my gym bag, my handbag, or any bag toting my essentials. I considered them essentials primarily because round about 4 p.m., just before an evening run or workout, I’d be crashing hungry from not having eaten an adequate breakfast (or lunch). Voila, my power bar to the rescue. Sometimes that crash was truly that: shaking like a leaf, sweating, lips buzzing a little. I understand now that the Corner Bakery sandwich, fruit, and potato salad the office meeting luncheon offered was nearly 100% carbs. Throw in a toffee crunch cookie, and forget about it. I might as well check myself into the nutritional rehab for good. What my new big, healthy breakfast and generally protein-rich practices have taught me is that I should have eaten that power bar first thing in the morning. And not on its own (but in a pinch, okay)—with an egg or two (minus a yolk or two), a scoop of yogurt or cottage cheese or a glass of lowfat milk (not skim; a little fat is important for absorption of the nutrients), some vegetables and fruit. My all-time favorite energy bars are made by Kind, dried fruit and nuts with a satisfying chew. My apricot-loving Lebanese soul fixed on Kind’s apricot-coconut bar; it’ll knock your socks off. This recipe gets after those flavors. Turns out making your own power bars, energy bars, fruit and nut bars…it’s incredibly simple. The only requirements are a food processor and a few high-quality ingredients. 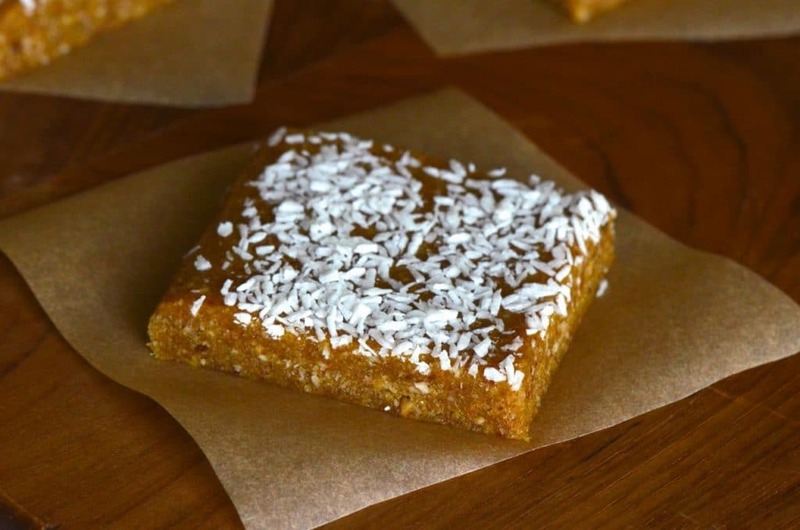 Slice a bar with (not for) breakfast, and see just how powerful (and kind) they are. I like to eat these directly from the freezer; they are chewy and cold (they don’t freeze completely solid). Feel free to experiment with other dried fruit and nuts (but the dates are key), as well as other protein-rich mix-ins, such as chia seeds. A scoop of whey protein powder is a great addition too. Makes 9 3-inch bars. 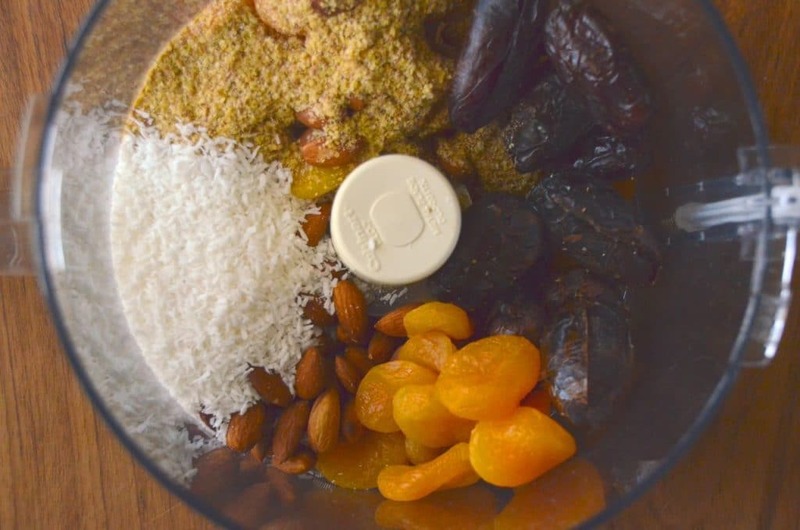 In the bowl of a food processor, add the apricots, almonds, dates, wheat germ, and half of the coconut. Pulse until the fruit and nuts begin to break down, scraping the sides of the bowl if needed. Add the lemon juice and pulse numerous times, until a paste begins to form and then the paste balls up. Tip the dough onto a large sheet of plastic wrap. Fold the wrap up over the dough and flatten the dough into a square about an inch thick, shaping the edges and flipping the packet over to continue shaping and flattening. 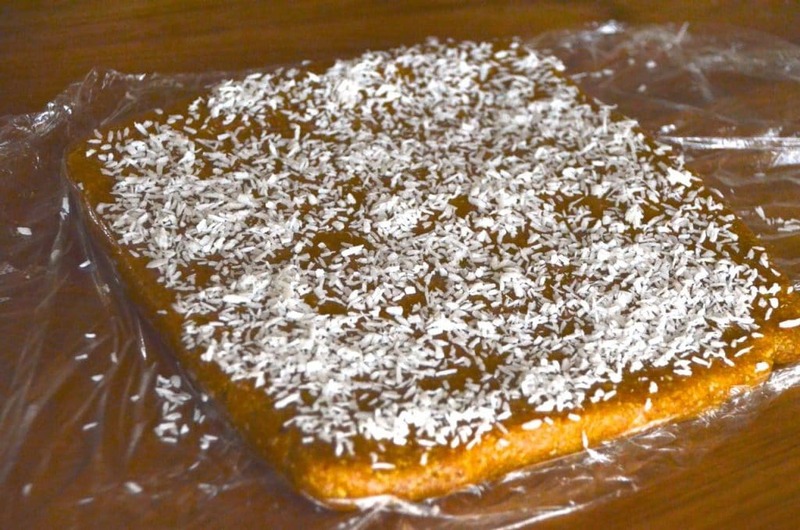 Lift up the plastic wrap and dust the top of the square with the remaining coconut. Wrap it tightly and freeze for at least one hour and up to several weeks, slicing bars off as needed. Lebanese-inspired, protein-rich breakfasts Crustless Spinach and Feta Quiche with Sumac Recipe. Say yes to the dress. 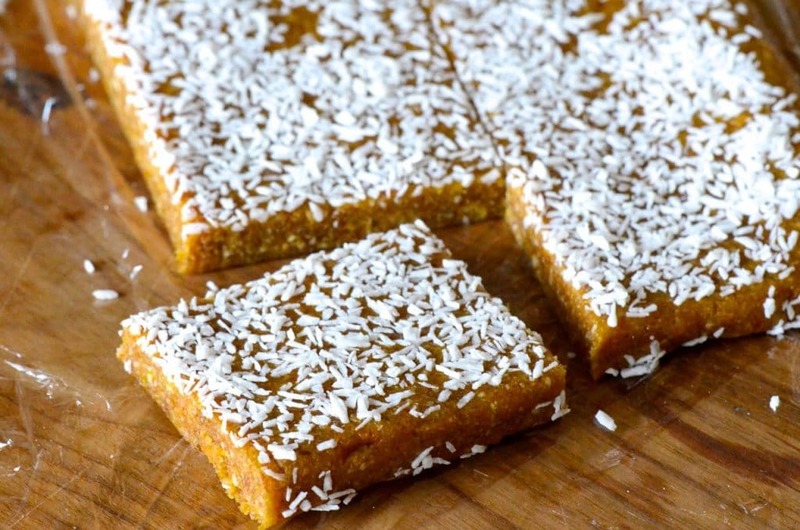 18 Responses to "Homemade Power Bars Recipe: Apricot Almond"
Maureen, What would you suggest as a substitution for wheat germ….must be Gluten Free…Chia or Hemp seeds?? Hi Linda–absolutely, chia or hemp works great. You could also substitute with a scoop of whey protein powder. I am definitely going to try this recipe. What is desiccated coconut? I use coconut all the time but don’t recall having seen that term on any of the packages of coconut I’ve used. Hi Ali! That’s just dried shredded coconut (a smaller-sized shred than flaked coconut). It comes sweetened and unsweetened. Around here I’ve found it only at the health food stores; Whole Foods has it too. More often I see unsweetened coconut “chips” or shavings; those could be used too and just ground up in the processor. Could one use deglet noor dates instead, or are they too dry/not sticky enough? Did you use them? I prefer them over the medjool dates. And the wheat germ? It was not included into the mix in the recipe and I would like to make this gluten free for my friend. Will it work with out it? The wheat germ is added with the dried fruit at the start–just fixed that, thank you. And yes, the bars should be fine without it! I knew it! second day, excellent recipe! I have all of these things in my pantry right now, and you may have convinced me to start eating breakfast everyday, even on the weekends! I love all of these things independently, which is why I have them all in my pantry now, but together – omg FLAVA BOMB! I’m making these this weekend…..